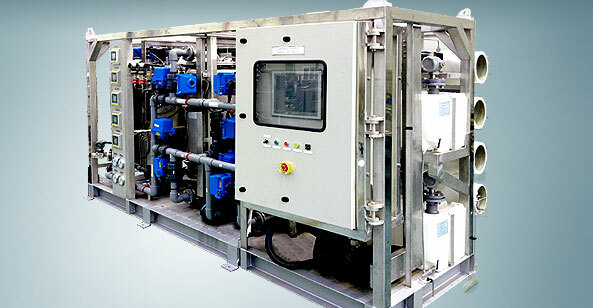 With using Reserve Osmosis method, Fresh Water Generator(FWG) is a desalination equipment which generates fresh water from sea water for drinking or shipboard application. In 1984, Krosys invented Fresh Water Generator with our own technologies. Since then, KROSYS has been the best choice for FWG to a wide range of ships from fishing boats, commercial vessels, navy battle ships and submarines as well as to offshore platforms. We provide our FWG to customers home and abroad such as Korea navy, Korea Coast Guard, Hyundai Heavy Industry, Hanjin Heavy Industry & Construction, Deawoo Shipbuilding & Marine Engineering, Samsung Heavy Industry, STX offshore & shipbuilding, Technip, Cosco. In particular, our Fresh Water Generators used in Republic of Korea navy have satisfied its highly strict qualifications and have been successfully operated in navy vessels. Our capabilities of design, manufacturing and quality management are the key factors which enable us to maintain the exclusive position in the niche market. With our renown after service system, we guarantee the stable and safe operation of our products. Also we run stocks of inventory to deliver parts as soon as fast with a reasonable price. Our teams of highly skilled service engineers provide a quick and accurate respond to customers' requests for installation, commissioning and training.